Yes that is a square snowman in the background. M’s art degree is finally paying off! If are anywhere near the East Coast or have been listening to any sort of weather report for the country you probably know that we in the NY area have been recently pounded with snow. Unlike Snowmageddon I and II, which did not turn out the be the blockbusters predicted by the national weather service, Snowmageddon III did not disappoint. 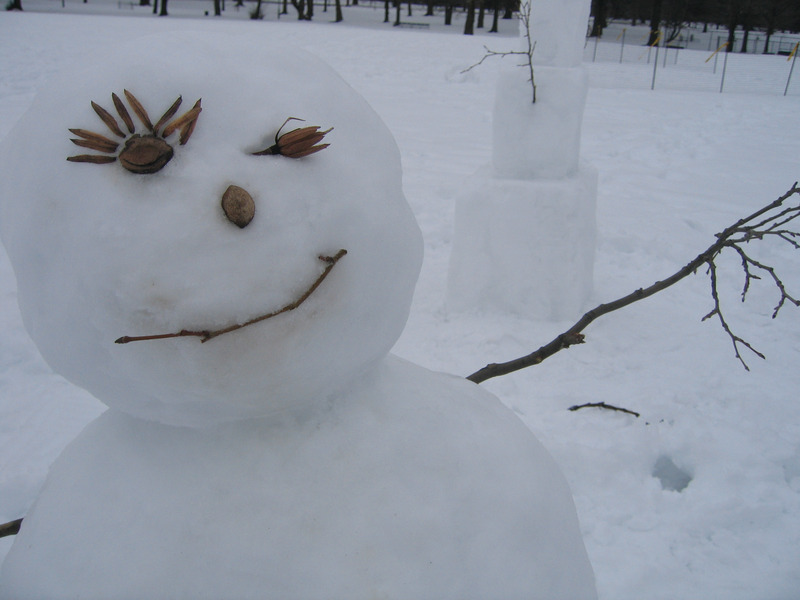 Unfortunately it didn’t result in a snow day for me on Friday (the MTA sure does pick funny times to provide good service…) but when M&I finally did get ourselves over to the park on Sunday we were met with the most wonderful snow for building snowmen! We actually built one snowman and one snow woman. We also were able to find an undisturbed patch that just begged for me to plop down and make a snow angel. We ended our outing at our new favorite watering hole, The Double Windsor. It was a lovely day indeed.